If you’re anything like me, your e-mail account is perpetually filling up with newsletters, magazines, digests, announcements and offers from the likes of AOPA, EAA, IAC, NBAA, AVweb, AIN, and others. I wouldn’t call this stuff junk mail or spam, because it’s useful, aviation-related information that I solicited at some point. But to be honest, there are times that the endless stream of data pouring into my computer feels like a gentle, Matrix-esque form of digital waterboarding. Add in a healthy stream of blogs, podcasts, RSS feeds etc. and it can be a full-time job keeping up with it all. In response, I’ve become rather adept at quickly skimming these publications and adding a few select articles to my reading list before hitting the delete key. Still, there’s a lot of good stuff out there. 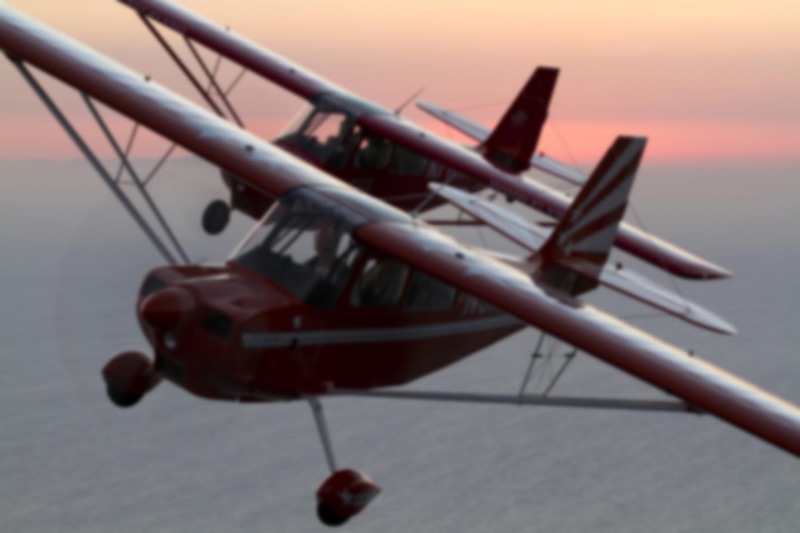 One of my favorites is the “IFR Fix” column on the AOPA web site. Author Dan Namowitz keeps the writing short and sweet, yet always imparts a thought-provoking lesson. Even if you’re not instrument-rated, there’s much to be gleaned from his posts. For example, Dan recently penned an article about an aircraft which was only a few hundred feet above minimums on an instrument approach and got a rude shock from the controller. The twin was 300 feet above minimums, descending, when ATC called with new missed approach instructions. The pilot flying was undergoing a checkride for an air-taxi operator. The check pilot responded to the radio call. “I said that it was a really bad time, but go ahead,” recounted the check pilot in a complaint to the Aviation Safety Reporting System, noting great displeasure at having to copy alternate missed approach instructions at such a high-workload stage. 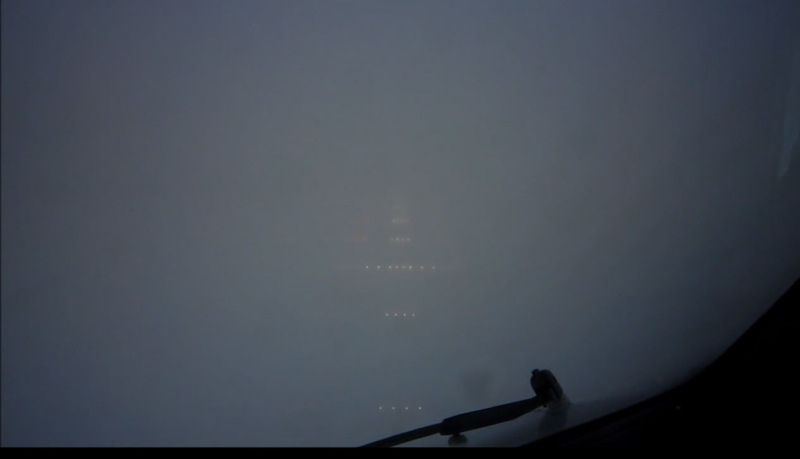 Since this was a checkride, the aircraft was probably on a practice approach in good VFR weather while the pilot flying was wearing a view-limiting device. The controller was likely aware of the weather, but since most of them these days are not pilots, probably didn’t understand why it would be a problem to make a pilot write a long series of instructions down on paper just as he was approaching the ground. Three hundred feet is about 30 seconds of flying time. It’s unreasonable to expect a pilot to grab a pen and paper, transcribe the procedure, read it back, set up the radios correctly, and still fly the plane. Even if the aircraft’s flying on autopilot, the request was outlandish at best. Lest you think that this is something which would only occur in VMC, let me say I’ve had this happen in actual low IMC while flying into Chino (KCNO). And would you believe it didn’t phase me in the least? No stress, no sweat, no frantic scribbling with one hand while trying to control the airplane with the other. You might be thinking I’m some sort of aviation Superman… and in a way you’d be right. I have a super power at my disposal that can crush the most dastardly schemes of evil air traffic controllers in a single second. I’ll let you in on another secret: you have this power too. It’s called “unable”. That word is your salvation and one which probably doesn’t get used often enough, because as pilots we don’t like to admit that we’re incapable. Incapable is a word we associate with failure and a lack of personal ability. We’re genetically programmed to do everything in our power to comply with a controller’s instructions. Besides, if ATC asks you to do something, there’s an implied assertion that you should be able to do it. Otherwise why would they be asking? Aren’t they trained professionals who know what they’re doing? Maybe. But don’t be fooled by that authoritative sounding voice-from-on-high, controllers are not infallible. They’re not pilots. And they most certainly are not in command if your airplane. You are. It’s an important distinction, and I take it as a huge accomplishment when a student of mine learns to use this magic word. The list of crazy things I’ve seen them instructed to do by FAA certified air traffic controllers is long, and it’s not limited to IFR operations, either. You don’t have to do any of these. According to the FAA’s Pilot-Controller Glossary, the word unable “indicates inability to comply with a specific instruction, request, or clearance.” Very simple. The reason doesn’t really matter. It could be safety-related, or infer a lack of equipment (GPS, for instance) or pilot certification (instrument rating or currency) for the requested action. It might be high pilot workload, low time-in-type, unfamiliarity with the phraseology or maneuver, or literally any other reason. If you’re not comfortable, then don’t do it. That little voice in the back of your head and those hairs on the back of your neck are worth listening to. I’ve refused quite a few instructions over the years, but looking back, if I could do it all over again I’d refuse a few more. There’s a VFR departure procedure leaving Santa Barbara which takes single engine aircraft way out over the water at very low altitude. I’ve flown that one on a dozen occasions and I kick myself for accepting it every. single. time. I understand the reason for the limitation (traffic separation), but that’s simply not my problem. It’d be better to hold on the ground until the departure path is clear for a climb than to get sent out over miles of cold ocean at low altitude in a single-engine aircraft, especially if you’re not equipped with rafts and life vests and/or have passengers who cannot swim. If you’re in a twin, that’s a different story. But the procedure at SBA doesn’t make any distinction, so it falls to the pilot, and far too often I’ve failed to make the smart choice. If more aviators were to do so, the flurry of refusals would probably cause the procedure to be changed, resulting in a safety improvement for the rest of our brethren. Short final on a Category 3A ILS approach into Oslo, Norway. Most definitely NOT the time to be “head down” in the cockpit. Getting back to Namowitz’s example, the check pilot did accept the alternate missed approach instruction, but were I in his shoes I’d have refused it for two reasons. Not only was it a poor idea to be head-down while low and descending, but there’s also the issue of setting up the missed approach procedure. These days, many of us are equipped with TSO-C129/145 GPS receivers and typically fly all missed approaches with GPS guidance. Naturally, we should be prepared in case reversion to a ground-based navaid is required, but even if you were prepared for that eventuality, according to the Aeronautical Information Manual, many alternate missed procedures are not published, even if the holding fix is. That means the procedure will not appear in the database or on the approach plate. The only way to obtain it is by having ATC verbally communicate it to you over the radio. Right out of 1940, folks. 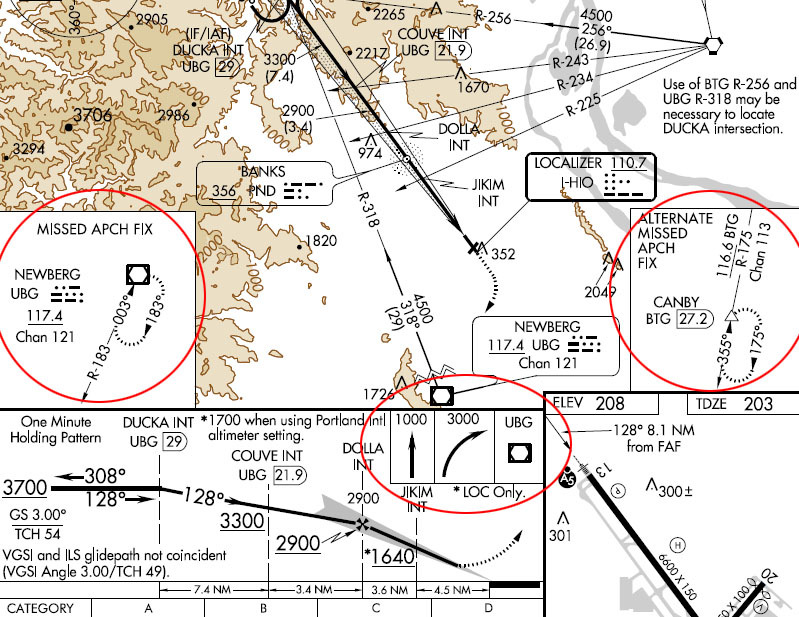 “Some locations may have a preplanned alternate missed approach procedure for use in the event the primary navaid used for the missed approach procedure is unavailable,” explains the Aeronautical Information Manual.”To avoid confusion, the alternate missed approach instructions are not published on the chart. However, the alternate missed approach holding pattern will be depicted on the instrument approach chart for pilot situational awareness and to assist ATC by not having to issue detailed holding instructions.” The alternate missed approach also may use navaids not part of the approach or the primary missed approach. How ironic is that? The alternate missed is used for instances where a navaid (typically ground based) is unavailable, but with GPS we can go there anyway. It’d be infinitely safer to simply allow a /G, /F, or other suitably equipped airplane to fly the published missed even if the navaid was offline. The approach plate has instructions (circled, center) to get you to the Newberg VOR (left), but no route for getting you to the “alternate” hold at CANBY (right). ← See & Avoid: Does It Work? How did I miss that one? You’re right though, the moniker absolutely adds to the aura of authority. As a student pilot, it would never have occurred to me to contradict an instruction from them, but the longer I fly, the more things get sifted through a mental filter first. Last November I was on an IFR flight from Evansville to KPNE at the freezing level and 1,000 feet below the overcast when Washington Center asked Mr to climb to 7,000. I told the controller that would put me icing conditions. Not quiet the same as “unable”, but there was no way I was going to do it. The problem was there was another aircraft on the airway at my altitude — going the wrong way. Terrain at my location did not allow much room for deviation. I am not sure if Washington was working him or not, but the next communication to me was a request to go to 6,000 until he flew under me. (That of course put me in the wrong direction for that altitude, but the controller was watching the airspace, so no worries.) I said I would try, but said it would put me at the edge. I flew in and out of the overcast and picked up rime ice both sides which I reported to the controller. (A little rime ice will not bring down a BE- 36, so no panic.) He did announce to other aircraft on the frequency that these clouds were producing ice. The wrong direction aircraft passed under me. I returned to 5,000. The rime ice evaporated and the rest of my return home was uneventful. The “misnomer” is their title….correctly stated ATC personnel are “coordinators”! I learned “unable” years ago along with “if you read me rock your chair”! Good article! The thought of Unable was the first thing that ran through my mind as well, but I think the fact that this was a check ride of sorts, it may have been accepted to test the capabilities. Personally, the test would have been “Pass” if “unable” was used just as well as intercepting the new instruction successfully. CRM and all the new “cockpit safety” stuff the FAA is throwing out there these days are tested now, and I believe this should have been a risk/return evaluation and rejected. Since the evaluator responded and it’s on tape, now they’re stuck, but as the PIC of that airplane, I think he should have spoken up. The training we’re used to is definitely the old-school. “Do as told” mentality in many ways and the FAA has a “way” about making pilots always think that some rule/regulation/document/whatever is being broken just by uttering the words, “I want to fly today”. I’m glad someone spoke up and that it ended up in one of those “SPAM” emails discussed at the beginning. I saw this and clicked it first. Great blog. As a student pilot on my long cross country, I was departing Norfolk and the ATC instructed me to maintain an extended departure out over the Atlantic. Conditions were extremely hazy and I found myself entering IMC rapidly, barely able to make out the horizon. I requested a turn out and was denied. Then the ATC ignored me for several long seconds. I did not know the “magic words”, but knew that I was pilot in command. I also feared dying more than feared violating directions of an ATC. I did not request permission, but radioed the ATC that I had entered IMC and was making a right turn. The ATC rapidly approved my actions and then vectored me back toward land and out of IMC. On that same flight, upon landing, the ATC advised me to expedite taxi and turn off immediately – he had cleared a heavy to land right behind my little Cessna 150. He called me twice to instruct me to expedite taxi, with urgency in his voice the second time. I have avoided that airport ever since. Wish I had known the magic words. Don’t fear the congested airports! You have as much right to be there as an airliner. “Expedite taxi” is a common instruction to a light GA pilot at a busy, controlled field. We tend to think it means “taxi faster!”, but it really means “taxi at the best possible speed consistent with safety”. if you’re already doing that and don’t feel comfortable going any faster, then you already area expediting. Thanks for the helpful and detailed examples. Great job! Even in my airliner I’ve had them attempt to vector me through thunderstorm, give me improper clearances, etc., etc. What amazes me is the young F/Os I fly with that are so afraid of “getting in trouble”. As we said in the USAF, “if you have the stick, shake it”. As a student pilot on my solo long cross country, as I was ready to depart Terre Haute, when 4 National Guard F-4 Phantoms departed just ahead of me. Atc stated I was cleared to depart, but I declined because of the wake turbulance that was possible just ahead of me, behind the 4 F-4’s. They politely ackowledged the situation. Wow, I would have declined it too, if nothing else just to watch them blast off! Earlier today, being vectored into KMRH IFR, I was instructed to turn left to 150 (I was heading 120 at the time). I didn’t quite catch the heading so I asked him to “say heading again”. He repeated the instruction. I figured he probably didn’t want me to circle since there wasn’t any other traffic in the area, and he would tell me if he did, so I said that 150 was to my right. He said “Sorry, turn right to 150”. Easy enough, but I’m not sure I wouldn’t have turned left when I was a student. When I first started reading this I couldn’t help but think of probably the most famous “unable” call we have all likely heard. When they landed in the Hudson River Sully repeatedly told the controller unable. A little different situation than cruising around in a 172 but equally as powerful at possibly saving a life, or many lives. That was certainly a memorable radio call! Good info! Hopefully your blog gets more attention as you have some sound advice on here. For a possible topic, can you talk about when a pilot should declare an emergency (MAYDAY or PAN PAN) and the benefits of doing so? There seems to be this thought that declaring an emergency is bad and many pilots are hesitant to do so; at least around where I fly. We had the international airport firefighters send our company a memo telling us to declare an emergency and reinforcing that they are there to provide support in the event an aircraft has a problem (and that they train specifically for this), when one of our aircraft wouldn’t declare an emergency when they had hydraulic problems (think gear). ATC ended up calling the trucks and they followed the aircraft all the way to the ramp. Good idea for a topic, Jordan! Some pilots don’t realize that the controller is capable of determining an emergency exists even if the pilot does not declare one (see FAA Order 7110.65, Section 10-1-1, Para. C). That’s probably what happened when the controller called the firetrucks to follow your company’s aircraft to the ramp. I did a similar thing as Robert A. Marmon when returning from Indianapolis to KDPA [home base] in a C172. When requested to descent to an icing altitude, I said “I’d like to stay up here out of the ice.” I wanted to stay in the sunlight to melt the rest of the frost. Not quite “unable” but I negotiated a slam dunk with minimum time in icing conditions *after* I got rid of a small accumulation. FAR 91.3 means you TELL the controller what you are going to do the protect your tush. Good point. Sometimes the controller doesn’t know what we need unless we tell them. They’re on our side, so if we communicate our reasoning, sometimes they can help us in ways even we haven’t anticipated. Yes, in the end, the controller & I ended up negotiating a “slam dunk” that kept me out of the icing conditions. Sorry if I am repeating myself; I may have mentioned it in my original post. Another time the CHI TRACON replied to my callup after a hand off from CHI Center: “Eight Hotel Alpha, what can I do for you?” Figuring that the computer botched the handoff, I replied “I’m IFR to DPA, and I’m in the soup.” In other words, you have to take me since I’m IFR traffic.